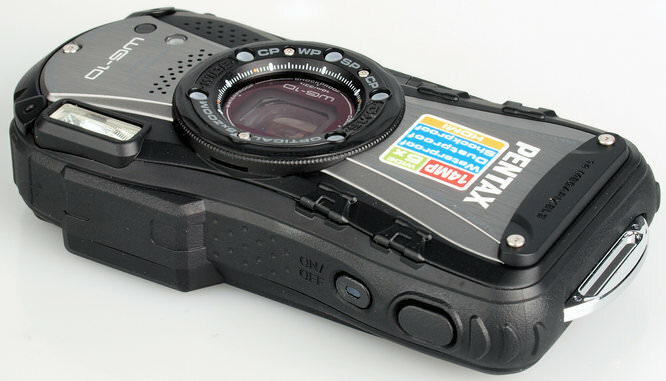 The Pentax WG-10 is an entry-level waterproof camera, that's also freezeproof, crushproof and shockproof. Daniel Bell reviews. The WG-10 is Pentax' latest entry-level camera designed for outdoor and underwater use - it's waterproof, shockproof, freezeproof and crushproof. It has a 14 megapixel sensor, 5x optical zoom, is available in black and red and costs around £140.00. 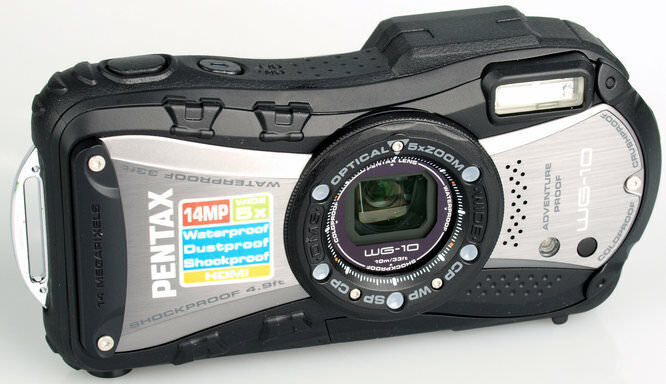 The Pentax WG-10 is waterproof to 10m, shockproof to 1.5m, freezeproof to -10°C and crushproof to 100kg. It has a 14 megapixel CCD sensor and a 5x optical zoom lens, which is a 35mm equivalent of 28-140mm, with Pixel Track SR (Shake Reduction) to help keep your images blur free. When shooting there is Auto Picture mode which automatically selects the most appropriate shooting mode from 16 different scene modes. There is a Digital Microscope mode which allows for macro shooting as close as 1cm, with 5 LED lights around the lens to brighten up your subject. There is a macro stand included to help maintain the minimum focusing distance to the subject (picture size is limited to 2 megapixels). You can edit your picture via the playback menu with 12 digital filters. Videos are recorded in 720p HD at 30 fps, with the camera able to be connected to a HDTV via a HDMI cable for playback. The Pentax WG-10 is rubberised on the outside and has an unusual shape, all of which makes it easy to grip, even in cold, wet conditions. This entry level model doesn't have the dual locking system for the memory card and battery as featured on the WG-3. A plastic ring is supplied with the camera which acts as a support for using the digital microscope mode. On top of the camera you'll find the on / off switch and the shutter release. 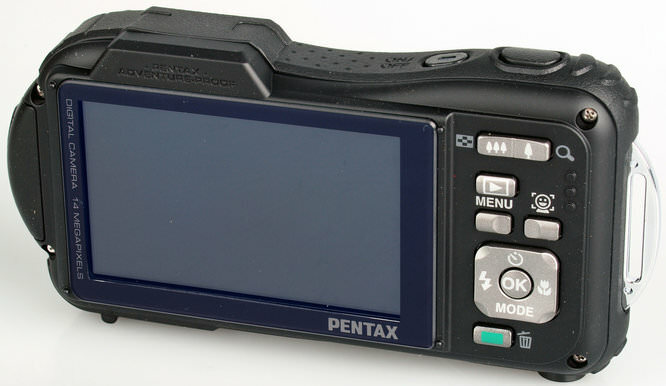 On the back there are two buttons for adjusting the optical zoom, the lens is housed internally within the camera. Other buttons include playback, face detection, menu, green and a d-pad which is used for cycling through the menus and also gives access to the self-timer, flash, focus and shooting modes. The 2.7 inch screen is bright and clear and has a modest resolution at 230k dots. It has an anti-reflection coating to minimise glare and reflections. The menu system is well laid out and easy to use. Battery life is rated at 260 shots according to CIPA test results. We took a number of shots to test the camera's responsiveness, from switch on to first photo, shot to shot, focusing speed etc. We take a number of shots and then use the average to ensure accurate and consistent tests, making it easy to compare with other cameras. Continuous shooting records in full 14 megapixel resolution, with burst mode limited to 5 megapixels. Sample Photos - Images tend to be well exposed with good colour reproduction. Portraits show red-eye when using the flash, but you're able to remove this in playback. The Digital Microscope allows for very impressive macro shots. If you want to images with a higher dynamic range, you can select options to increase details in the highlights and the shadows. Lens Performance - Images have a decent level of detail at both ends of the lens, although they are a little softer around the edges and in the corners. Purple fringing isn't too much of an issue in contrasting areas. The lens has a minimum focusing distance of just 1cm, so it's possible to take impressive macro shots. ISO Noise Performance - Noise is low at ISO 80 and 100, with only a slight increase at ISO 200. Images become a little soft at ISO 400 with image detail reduced at ISO 800. More detail is lost at ISO 1600, with a very soft image produced. Image quality is poor at the highest settings of ISO 3200 and 6400, with image size limited to just 5 megapixels. White Balance Performance - Under the incandescent lights, the auto white balance (AWB) has an orange cast, with the incandescent preset taking a much better picture. Under the fluorescent lights, the AWB performs well, with a colour cast when using the fluorescent preset. Panorama mode - The WG-10 stitches three shots together in panorama mode. There are some stitching issues, but it's hardly noticeable when sharing on the web. Digital Filters - The image tones can be used during recording, the rest of the filters above have been added using the editing options available in playback. Video - Below is a video recorded at 720p HD. Quality is OK. You're not able to use optical zoom during recording. The Pentax WG-10 is available for £140. Recommended waterproof cameras include the Panasonic Lumix DMC-FT5, available for £295, the Nikon Coolpix AW110, available for £270 and the Canon Powershot D20, available for £260. 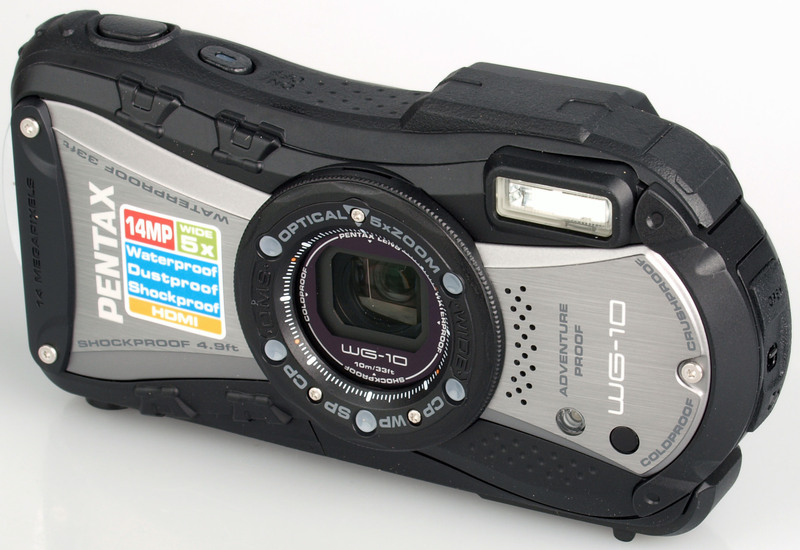 For more waterproof cameras, have a look at the Top 10 Best Waterproof Cameras. If you are on a budget, the Olympus Tough cameras score well in our reviews, such as the TG-620 and TG-320. 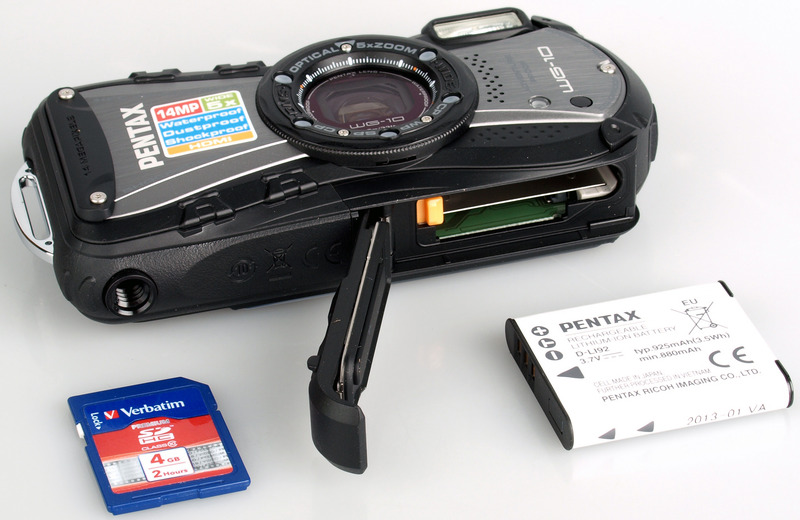 The Pentax WG-10 offers decent picture quality at a reasonable price a waterproof camera. There are better waterproof cameras available, but if you're on a limited budget, or the camera is for a child, you can't go wrong. You can create unique pictures with the Digital Microscope mode, as well has the range of digital filters available for editing pictures in playback. Was the Underwater Mode shot actually taken under water? ?